Mondo saved the best of their Ken Taylor Gallery show in Austin Texas for last. 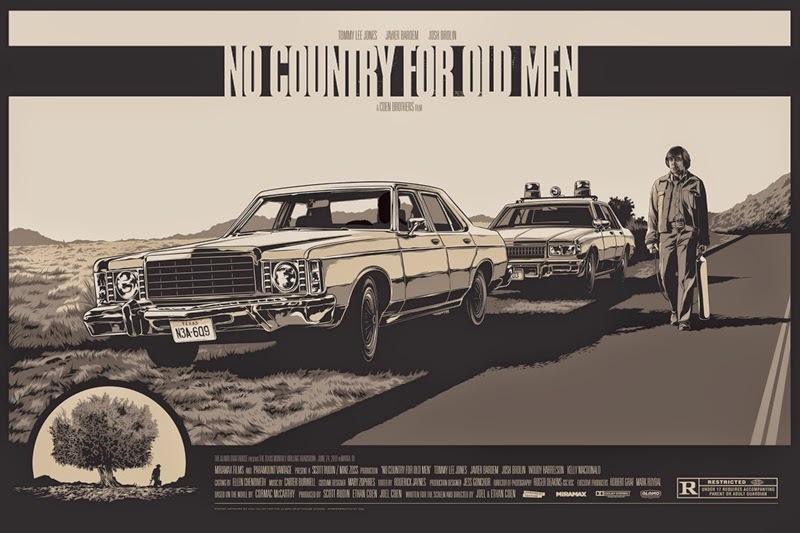 Above you can see Mondo's poster for the academy award winning 2007 Coen Brothers film: No Country for Old Men. Mondo's stuff is always well done, but this is truly one of the best pieces ever to come from the pretentious gallery. Taylor's scene steeling talent is on full display in this work of art, and it truly captures the uneasiness and societal degradation of the Coen's classic. This one became an instant grail piece already selling for well over $300 on Ebay. Hopefully Mondo will give the public a chance at this grail later this year through their online store: Mondo Tees. Thanks to Collider for the Image!